A celebrated organic farmer of peaches, grapes, and nectarines in California, David Mas Masumoto is also a gifted storyteller and chronicler of the considerable challenges and rewards of organic farming. 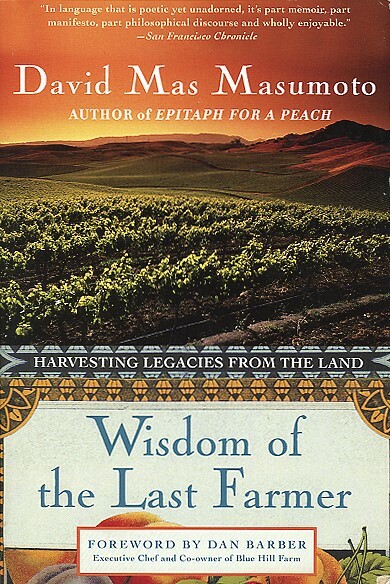 Masumoto’s memoir, Wisdom of the Last Farmer, Harvesting Legacies From The Land (Free Press, A Division of Simon & Schuster, New York, NY 2009), is a tribute to his father, whose dogged persistence created the “perfect peach” celebrated by Alice Waters at Chez Panisse. It wasn’t an easy path. Masumoto’s two grandfathers emigrated from Japan at the end of the 19th century, one from the Hiroshima area and the other from Kumamoto in southern Japan. Though prohibited from owning land because of alien land laws, they worked and saved with the hopes of buying land once their sons were of age. At the outbreak of World War II, however, their Japanese-American families were interned at Gila River Relocation center in the Arizona desert. After the war, Masumoto’s father purchased eighteen acres of hardpan in California’s Central Valley. In this gentle narrative, Masumoto weaves his father’s personal story together with penetrating observations about organic farming, aging, and the challenges our society must confront if we want to fix our land and food system. Wisdom of the Last Farmer admits us into the Masumoto family circle, where we have the privilege of listening to elders reminisce about farm and family. Masumoto tells us how he followed the swerving tractor-wheel tracks that told the story of his father’s first stroke. Those of us who have faced the inevitable decline of parents will recognize the hope, determination, uncertainty, and sadness with which Masumoto faced the reversal of roles as he worked with his father to find ways to contribute to the productive running of the farm. We understand the determination to communicate with a parent who can no longer speak, and who must relearn the most basic farming tasks. Reading this book, we also come to appreciate the impacts of larger economic or policy trends on family farmers. In one telling example, Masumoto relates that in the mid 1970s the USDA began encouraging farmers to grow shiny, colorful fruit to appeal to the large supermarket chains that were starting to dominate the market for produce. The USDA went so far as to develop color cards for fruit varieties. With this standardization on color, rather than flavor or nutritional content, older varieties of nectarines and peaches lost their value in the market. As a result, in 1978 David Mas Masumoto and his father watched sadly as their heirloom Le Grand nectarine trees were pulled up and burned because the fruit was too yellow for the current cosmetic standards. According to Masumoto, This must have hit Dad as an insult. He was often judged by the color of his skin – and now, as frivolous as it sounded, so were his fruits. Thankfully, as the organic movement renewed our quest for taste and appreciation for older fruits, the Masumoto farm replanted Le Grand nectarines along with other vintage varieties. Masumoto’s poignant stories pull us into the life of the farm. Before we know it, we’re walking alongside him on a 100 degree day and suffering with muscle spasms from dehydration through the night. Next, we’re working feverishly to save a raisin crop inundated in an unusual late summer rain, or sifting through a junk pile for discarded tractor parts. I always knew farming was hard, but after this memoir, I will never eat another peach without thinking of Masumoto’s description of his father’s work gloves, which are never quite discarded. The split fingers of the leather gloves have been mended with duct tape and curl stiffly into fists. Like veterans, they seem to trade war stories as they crowd together in a workbench drawer, reminding me of their prior battles and our continuing struggles: they may be worn down but they have not forgotten.